Growing up across the street from each other, Scott and Cath have been best friends for most of their lives. Now they've graduated high school, and Cath is off to college while Scott stays at home trying to get his band off the ground. Neither of them realized that their first year after high school would be so hard. Fortunately, Scott and Cath still have each other, and it's through their letters that they survive heartache, annoying roommates, family dramas, and the pressure of figuring out what to do with the rest of their lives. And through it all, they realize that the only person they've ever wanted to turn to is each other. But does that mean they should think about being more than friends? One thing is clear, Change is an inescapable part of growing up, and we share unbreakable bonds with the friends who help us navigate it. This funny, extraordinary, and deeply moving book—set to an awesome '80s soundtrack—captures all the beautiful confusion and emotional intensity we find on the verge of adulthood...and first love. We Are Still Tornadoes by Michael Kun and Susan Mullen is not to be missed! Michael Kun is the author of the novels You Poor Monster, The Locklear Letters, and A Thousand Benjamins, among other works of fiction and non-fiction. He is a graduate of the Johns Hopkins University and the University of Virginia School of Law. He practices law in Los Angeles, California, where he lives with his wife Amy and their daughter Paige. 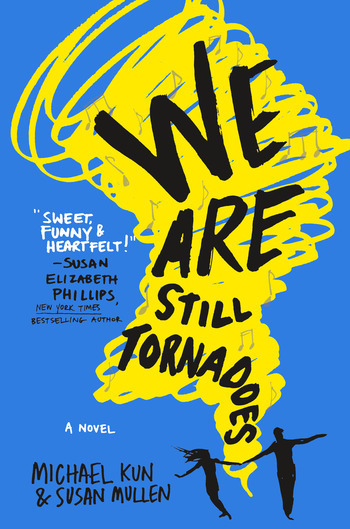 We Are Still Tornadoes is Susan Mullen’s first novel. She is a graduate of Duke University, where she studied English literature, and the University of Virginia School of Law. She practices law and lives in Northern Virginia. Sue has been married to her law school classmate Kevin Mullen since 1990, and they have two daughters, Hannah and Haley.